A growing number of our professional development courses are now offered online, as well as some offered by our Center for College Readiness. Now, if your only experience with online programming has been something like Defensive Driving, where you must spend a predetermined number of seconds on each page reading poorly written text and watching scare-you-into-wearing-your-seatbelt videos produced decades ago, then it would be understandable that you might overlook online programming. An online class in progress. Carroll Scherer, our director of professional development programming, started offering Web-delivered courses a few years ago to expand the market for our current courses. So our successful classroom option of Certified Financial Planning Certification Education Program was followed by a Web-delivered version in 2007. Our successful classroom Paralegal program was followed by a Web-delivered version in 2010. More recently we’ve added online options of our Human Resources programs. 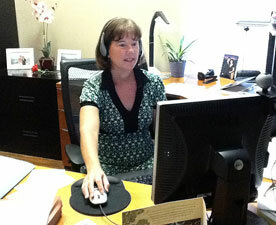 Carroll Scherer models the type of headset used in her online classes. Do people have apprehensions about taking a course online? Once people understand that this is not self-study, but instead is a live, regularly scheduled class, most of their apprehensions go away. For those who travel a lot, the fact that they can attend class from any computer with Internet access is a plus. And class recordings make it easy to view a class later if they miss one. What type of feedback do you get from students? They love it and say it is the closest thing to being in a traditional classroom. Both the video and sound quality are very good. They quickly get used to speaking through a microphone with the instructor and each other, as well as using the chat feature. 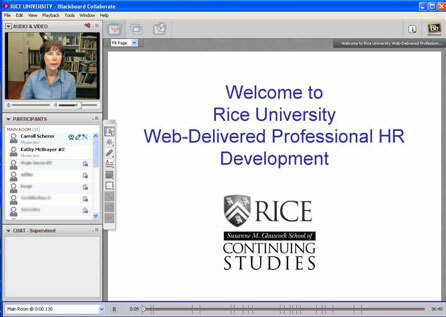 How is the interaction between students in a Web-delivered course? When sitting in a traditional classroom, there is a natural tendency to interact more. But the online students often find ways to connect outside of class – introductions at the beginning of class really help and many students exchange contact information.